I came to the end of a mini-era last week as I said goodbye to both Berg and A2. My constant companions on the farm are off to bigger adventures; A2 is headed home to New Hampshire where he’ll be working with his father as an environmental consultant (so, you know, he can actually use that degree). Berg, meanwhile, is leaving next Monday for a 10-week trip to Tanzania where he’ll be working on behalf of the Island Creek Oysters Foundation and Woods Hole Oceanographic Institution to start building a shellfish hatchery on the island of Zanzibar. (Check out details on how and why this is happening here.) While I’ve known for awhile that both would be moving on, it’s hard to see these guys go, especially since they’ve been such a large part of my farm experience so far. 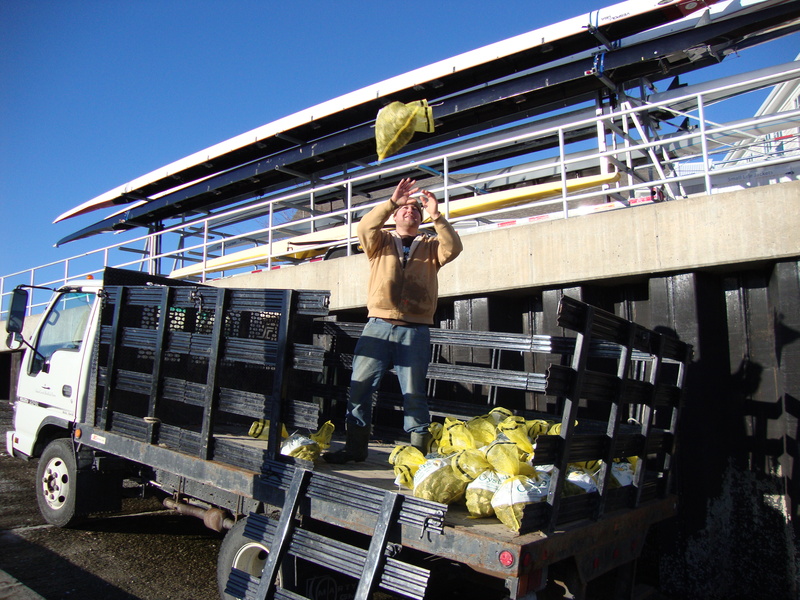 Seeing as it was A2’s last day on on the farm, I spent Friday afternoon with my crew (or what’s left of it), counting and bagging on the float. I’d been jonesing to get back down there ever since moving into the office so when the guys asked for help, I was happy to throw on my boots and a Grunden jacket again. The oysters have changed, believe it or not. 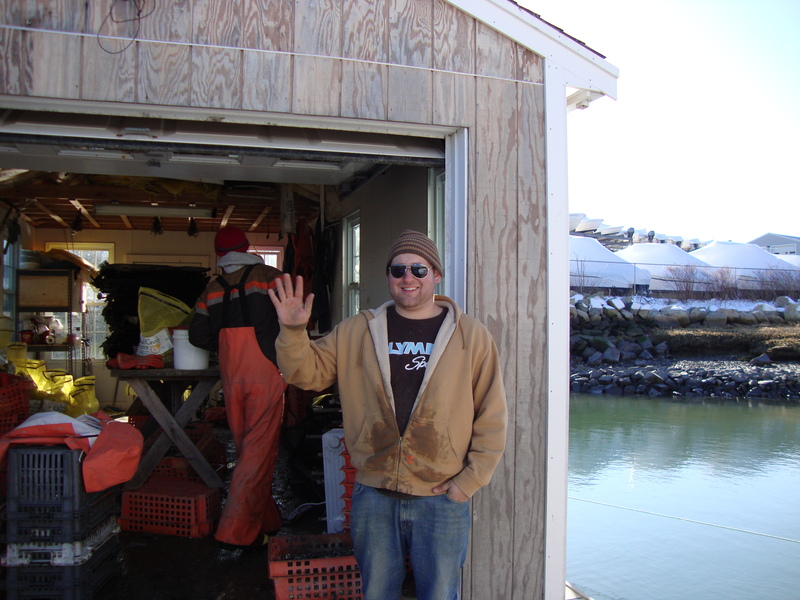 The guys have been pulling up those mesh bags we put down late in December and inside, our oysters are a different shape and color than the were when I left the farm. Some were slightly lighter and more golden than the deep green our oysters get when they’re grown directly on the floor while others were elongated and spindly instead of round and flat. It’s amazing what a difference a few months in the bags will do to the shells. Inside, though, the meat still tastes the same: briny and sweet with a firm, chewy bite. It was a great way to end what turned out to be an epic week. It started with the Oyster Stout launch party hosted by Eastern Standard last Monday night, which was followed by tastings at Harpoon Brewery on Tuesday and Thursday and an oyster and beer dinner at B&G Oysters on Wednesday. We drank and ate our fair share and also had a number of opportunities to connect with IC fans and our friends at Harpoon. Everyone at Island Creek has pretty much fallen in love with stout brewer Katie Tame, who is a natural in front of crowds. She and Skip did a great job playing off each other for the crowd at B&G on Wednesday night. We ended the week a little ragged but still found the energy to toast A2’s farewell with one last beer at Shop Friday (a farm tradition of beers and scotch at one of our grower’s shops). So what’s next? As for me, I’ve decided to stay on the farm for a little while longer. If it isn’t obvious from my long rambling posts, I’ve kind of fallen in love with the place — and the people aren’t too bad either. As of now, I plan on staying through the summer to help Skip with the seed for another season and to help the guys plan Oyster Fest (mark your calendars: September 11th). It’ll give me a chance to enjoy another summer on the water and to watch the seed we planted last fall grow up into big, tasty, edible oysters. After that, I guess we’ll see. A2 come back! This means I’m going to have to fight for Kanye all alone next summer. Miss you all! Erin, let’s have dinner soon. I love your blog, it is so fun! And I can not wait for Oyster Fest!